We use our smartphones in place of maps, health trackers and cameras, so why not use them to replace our credit cards, too? It’s not like Americans don’t already choose their smartphones when it's time to shop and bank online. Yet a 2013 survey from financial services company TSYS (PDF) found that just 6% of Americans valued being able to use their card or cash via a smartphone virtual wallet. Consumers seem comfortable with credit cards, whether they're signing a receipt, entering a PIN or waving the card at a contactless payment terminal, and they see little perceived extra value in using smartphones to pay in stores, asserts Rajesh Kandaswamy, an analyst at information technology research and advisory firm Gartner. “Consumers need an incentive to move to mobile payments,” he says. And Softcard mobile payment app (formerly Isis) does that, offering a dollar off every purchase you make with an American Express Serve card (up to 50 transactions). 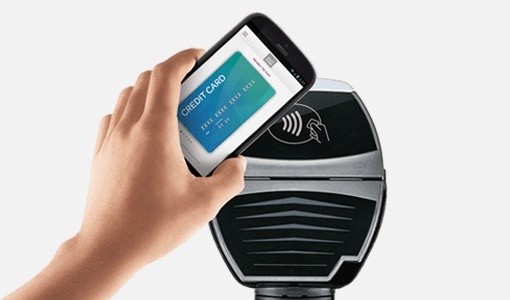 The upcoming launch of Apple Pay will also help. The app will download automatically in October as part of an update to iOS 8 for the iPhone 6 and iPhone 6 Plus, and it works with American Express, MasterCard and Visa cards. “Given that Apple already stores millions of customers' financial info in iTunes, Apple Pay is likely to be a catalyst for higher adoption of the smartphone wallet because it reduces the efforts of millions to even try mobile payments,” Kandaswamy says. 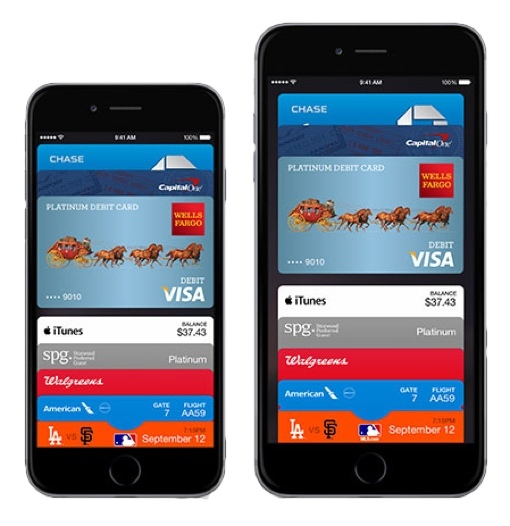 Apple Pay is also supported by major banks including Bank of America, Chase and Citi. These big banks are unlikely to spike the cost of processing Apple Pay transactions versus credit card transactions, giving more merchants more incentive to make the service available to their customers. A mobile wallet app offers a better way to manage payment cards, from debit and credit cards to discount vouchers and loyalty vouchers, Kandaswamy says. “A mobile wallet app can also offer better control over finances, in the sense that you have a single place to examine and analyze your purchases,” he says. Paying with your smartphone can speed up the checkout process. Instead of rifling through your wallet (and possibly realizing you forgot to bring a card at all), simply tap your smartphone on a payment terminal to authorize a transaction and simultaneously apply discounts or loyalty points. Most current smartphone wallet apps with a tap-to-pay feature require a phone with a Near Field Communication (NFC) chip to work. For iPhones, that means the iPhone 6 and 6 Plus. Most Android phones that run OS 4.0 or newer are NFC-compatible, although some apps require a special, extra-secure SIM for storing financial information. Check with your carrier to see if your Android is e-wallet-friendly. If you use a Windows Phone or BlackBerry device, you're facing a wait. Microsoft recently announced Wallet for Windows Phone for storing credit cards, loyalty cards, vouchers and tickets, but the app's tap-to-pay functionality isn't yet supported by any Windows Phone device. And although Visa approved the BlackBerry mobile payment framework last year, we have yet to see any official launch of a wallet app. But the mobile payments game is heating up. Retail giant Wal-Mart has announced that it is piloting its own mobile payments system, along with several other large brands. Current C, which will work on any smartphone, won't launch until next year. Apple Pay will be available in October for the iPhone 6 and iPhone 6 Plus as well as for the Apple Watch when it launches next year. Apple Pay holds credit and debit cards, and iTunes users can automatically link the credit card they already have on file. Once you've activated Apple Pay, you can use it for secure one-tap purchases in shopping apps as well as services such as Uber and Panera Bread, without having to fill out billing and shipping information. Tap to pay: Touch the front of your iPhone 6 or 6 Plus to a contactless payment terminal while holding your finger over the TouchID fingerprint. You get a gentle vibration when the transaction is complete. Why you want it: It's fast. Using the iPhone's fingerprint scanner to tap and pay beats signing a receipt or entering a PIN code. And with the support of every major U.S. bank, the number of shops that accept Apple Pay could skyrocket very quickly. Where you can use it: Use it at about 220,000 shops over about a dozen retailer chains, including McDonald's, Subway, Bloomingdales and Walgreens. What phones support it: iPhone 6 and iPhone 6 Plus only. Google Wallet holds credit and debit card information as well as loyalty cards and discount coupons. You can transfer money into a prepaid card called the Wallet Balance. If you're using an NFC-enabled Android 4.4 phone, you can pay for purchases in store. Tap-to-pay won't work on iPhones or Android phones running OS 2.3 or older; however, these can access the Wallet's other features, such as sending or requesting money, one-click checkout at online retailers and tracking orders made with linked payment cards. Tap to pay: Open the Google Wallet app on your phone, then enter a PIN before holding it against the terminal. Security: Google encrypts and stores users' financial details on its servers, and use of the app is protected by a PIN. If someone should manage to pilfer your phone and guess your PIN, Google claims its Fraud Protection covers 100% of "verified unauthorized transactions." Why you want it: Google Wallet supports dozens of loyalty programs and coupon sites. Adding points and receiving discounts when you purchase something is hassle free, even if you've forgotten what vouchers and cards you have. Where you can use it: Use it at any store where contactless payments are accepted. What phones support it: Android OS 2.3; 4.4 and higher required for tap-to-pay; iOS 6 or newer, but does not support tap-to-pay. Softcard was created by AT&T, T-Mobile and Verizon, so (you guessed it) you'll need to be on one of these carriers to use it. You'll also need an NFC-compatible Android phone. The app supports American Express, Chase and Wells Fargo credit cards plus a handful of loyalty and discount cards. You can set up an American Express Serve account and use it to make payments with any debit or credit card or U.S. bank account. Tap to pay: As with Google Wallet, open the app, enter your PIN, then hold your NFC smartphone against the payment terminal. Security: To use Softcard, you need a secure SIM card that can store your financial information so that only the Softcard app can access it. (You can request one from your carrier, assuming your phone is Softcard-compatible.) For each transaction, a one-use token is created so that your card details are not sent to the merchant. Like Google Wallet, a PIN protects the use of the app. Why you want it: Softcard also scans nearby merchants for offers or discounts available to Softcard users, which you can then use at checkout. Where you can use it: Use it at dozens of chains including Urban Outfitters, Subway and Walgreens. Check the full list at paywiththis.com. What phones support it: Android 4.0 and higher. LoopPay, a Kickstarter success, works via a smartphone app combined with a Loop device — either a fob ($39, pairable with iPhone or Android phones) or a ChargeCase for iPhone 5/5S ($99). Credit and debit cards, loyalty and rewards cards and your driver's license can be scanned into the Loop app. Most Android phones running on OS 4.2 or newer work with Loop, but some have compatibility issues; check to see if yours works at LoopPay's compatibility page. Tap to pay: Hold your fob (or ChargeCase-sheathed iPhone) by the credit card terminal, then swipe your phone screen or press the fob button to pay. If you need to show ID (say, for an alcohol purchase), hit the ID icon on the phone screen and display a scan of any identification you've loaded. Security: All payment information is encrypted and stored in a secure chip inside the Loop fob or ChargeCase, and a PIN protects the use of the app. Why you want it: LoopPay works at 90% of retailers around the world — far more shops than any of the other apps. Where you can use it: Use it anywhere there is a credit card reader. What phones support it: iPhone, Android 4.2 and up. This iPhone app combines your loyalty card and prepaid card balance into one handy app for tap-and-pay, keeping track of rewards you're due and seeing how much more coffee you need to buy before you hit the next reward. 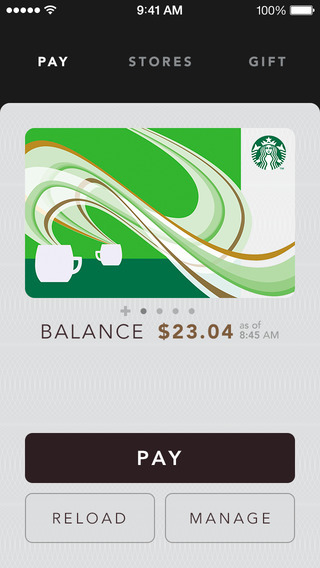 Starbucks got this right — the app is used for $6 million in transactions every week. If you're in a shop that accepts PayPal, log in to the app (iPhone and Android) and check in to your location. You can then take your purchases to the register, tell the cashier you're paying by PayPal and simply approve the payment on the phone screen. It's not quite a wallet replacement, but it is handy if you forget your real-world wallet. The app can scan your vicinity for PayPal-friendly merchants. Set a password on your phone. Download an app for finding your phone if it's lost. When your phone becomes your wallet, loss or theft becomes even more inconvenient. Only download mobile payment apps (or, indeed, any apps) from sites you trust. Check the app’s ratings and permissions and read reviews to make sure they’re widely used and respected before you download. Turn off your device’s NFC connection when you’re not using it. 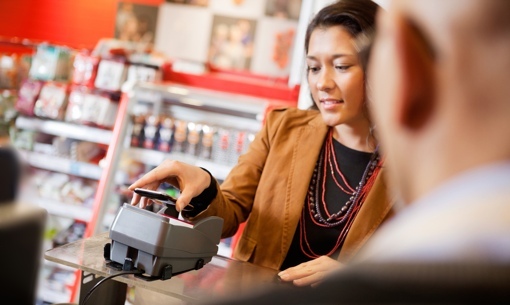 Use NFC payment stations with caution; you might end up paying for someone else's purchases. Will you be replacing your wallet with an app? If so, which one? Let us know in the comments. Corrected 10/1/2014: The TSYS survey asked about the value of being able to use cards or cash via a smartphone virtual wallet, not interest in using smartphones in lieu of a credit or debit card. Notwithstanding having secure access to the app, what happens if the ‘phone is lost? Is the account frozen and you have to wait for a replacement account on a new ‘phone? I suspect that an unlinked backup plastic credit card would be a must have. Comments? Apple Pay uses a device-specific account number in transactions (instead of your actual credit card details), so you can disable that device-specific account number instead of the account itself. With the others you can remotely disable the app but keep the account. In any case, you’re probably right - a backup card would be handy, just like if a real-world wallet was lost! It was so weird that when I searched the tap to pay website, paywiththis.com, site the heading had ISIS on it. Could this be run by the terrorist group by the same name?..also can you use it if someone else bought you a phone and the phone was in someones elses name? Thanks.. The payment service was, until recently, called ISIS. However, they just went through a re-branding to “Softcard” for rather obvious reasons. Looks like everything hasn’t been updated yet. The payment services are generally tied to an account you control. So you could use the same payment app on different phones or move it to a new phone if one is lost. ISIS for America Express Serve was established before the Mideast ISIS acrylic ever started. But because of ISIS’s arrival in the MidEast, American Express decided to get out ahead of a lot of confusion by changing the app name to Spftcard. If you had the original ISIS app it changed to Softcard already. Check in your apps to make sure it shows that way. If not, call ATT or Verizon about it. BlackBerry definitely did have it first!!! Media loves to quickly write BlackBerry off, but I’ve also been using my BB for my visa payments anywhere a contactless terminal is available. While they have no app of their own, most Canadian banks have a mobile wallet built for BB, as does mobile carrier Rogers. It’s not the media that’s written BlackBerry off, it’s the market. BlackBerry’s current market share is now less that 1% and is the only mobile smartphone operating system that is actually losing share as the overall market continues to skyrocket. No app, no OS, no device in the marketplace is secure. Everything has a backdoor which means it is hackable. Since the sloppy fed.gov is listening, chances of revelation are almost guaranteed. Persons in banks are required to report any suspicious behavior (not limited to your banking). Even deviation in attire is fair game. There is GPS in your cell phone and your car. 168 high def spy satellites watch nearly every inch of the USA 24/7/365; they can count the veins on the fly sitting on your steak in the backyard of your home. We have surpassed 100 million security cameras. Even billboards have facial recognition. 2018 will usher in mandatory facial recognition and license plate readers in mall parking lots. Look at any media outlet. You can see the buffoons at every level of government. They couldn’t secure a pet rock. Serious crime is routine and is hardly ever seriously punished. Thank the ABA and your local state bar. None of 26 spy agencies that you can’t know exist, none of the 5 you can know, no police agency, no badge carrying person anywhere is charged with your personal security. Not one. By the way, it is a federal crime to know about the 26 .... Yep, asininity in the (illegal) democracy reigns supreme.